This is a recipe for a natural hair lightener. It uses 3 natural ingredients to gently lighten hair. Lemon has been used forever to sun bleach hair in the summer. Chamomile has also been used for hair lightening. Lastly, cinnamon reportedly releases low levels of peroxide which can gradually lighten hair over time. 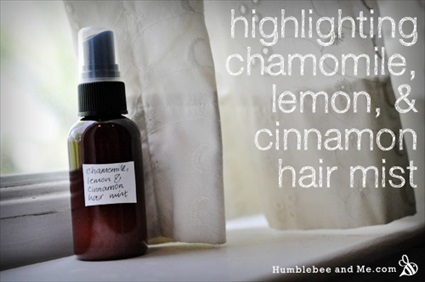 Marie of Humblebee & Me shares her nice, simple recipe for a mist that highlights hair using ingredients that include chamomile, lemon and cinnamon. The directions are simple and there are some nice, helpful photographs. I love Marie’s recipes! Click on the How to Make a Chamomile, Lemon & Cinnamon Highlighting Hair Mist link below to see the complete post.